Snowshoes are a practical mode of winter transportation, and they are also a symbol of practical ingenuity representing thousands of years of cultural history and adaptation to the country’s snowy winters. It is believed that snowshoes arrived in Canada during ancient migrations at least 10,000 years ago from eastern Siberia over the Bering Strait. In 1608, Samuel de Champlain provided the first written account of the First Nations using snowshoes to walk across the deep winter snow. Recognizing their value, Europeans used snowshoes for hunting and trapping, and for exploring the rugged landscape. In the mid-1800s, snowshoeing became a popular recreational activity, with clubs meeting for hikes and competitive races. The Canadian Snowshoe Union was formed in March 1907 to regulate the sport. In the 1970s, lightweight metal alloy snowshoes were introduced and enabled swifter movement. Snowshoe competitions have been popularized since the Yeti Mountain Snowshoe Series was founded in 2001. Ontario hosted a Yeti race in 2013 in Collingwood. 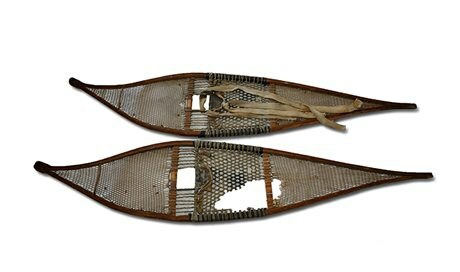 Snowshoes, from the Ontario Heritage Trust Collection, Homewood Museum, Maitland, Ontario. Read more about the history of the snowshoe on the Canadian Icons website. See an online exhibit on snowshoes, including historical examples from the University of Maine’s Hudson Museum. Learn more about the Yeti Mountain Snowshoe Series held in Canada.